The Labrador Retriever is a large muscular dog with an athletic built, slightly longer than tall. The chest is moderately broad. The head is wide and the muzzle is relatively long. The ears are moderately large and pendent. The nose is either black or brown, depending on the coat colour. The jaws are strong. The teeth meet in a scissor bite. The eyes have a kind expression; they should not be droopy (like in the Basset Hound), and the eyelids must reveal no pinks. The tail is a distinguishing feature of this breed. It is very thick at the base, and gradually tapers toward the tip. It's medium length and extends no longer than to the hock. The height is 21 to 24 inches, the weight is 55 to 80 pounds. Females tend to be smaller. Labradors have a very affectionate and patient temperament, which made them a popular breed all over the world. Highly intelligent, they are easy to train and are often used for police, search and rescue work, as well as for narcotics detection. Labs love to play and need a lot of exercise. They love water and all water-related games, so keep that in mind when you want to please your companion. Labradors will love to please you in reward. They are very devoted and high-spirited. Another trait that made Labs very popular is their attitude to people and other animals: these dogs are not generally aggressive. Excellent with children. Overall, Labs are ideal sporting and family dogs that thrive as part of an active family or as a trusted hunting companion. Labradors are slightly more dominant than Golden Retrievers. 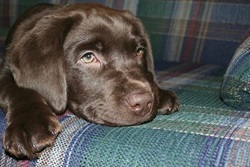 Labrador Retrievers come in solid black, yellow, and chocolate colours. Their coat is short, hard, water-resistant and easy to take care of. Little grooming is necessary. 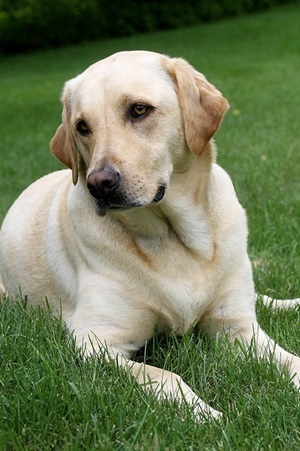 Labradors are basically very robust and healthy dogs with no breed-specific diseases. However, like other large dogs, they can suffer from hip dysplasia. Other health concerns are progressive retinal atrophy (PRA), eye disorders, and obesity. Do not overfeed. The lifespan of Labs is 10 to 12 years.